This was a bittersweet film to watch for obvious reasons, but I was happy to see that Mr. Gilliam was able to pull this together since his productions always seem to be plagued by some kind of misfortune. Besides all the extra commotion surrounding this film when you get to the actual story and the production design it is a wonderful kind of twisted fairy tale. It is a film that strives to be weird and odd and out there, but never really blows the audience away with originality. 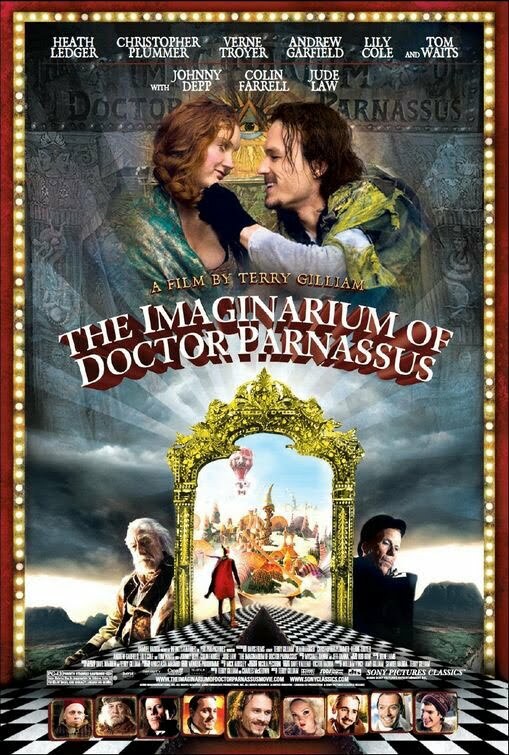 It is nice to see this kind of fantastical tale set in the present day where Parnassus' traveling show is one that sticks out like a sore thumb. His huge horse-drawn show on wheels is an appealing centerpiece for which to intrigue the audience. It begins smoothly with a fuzzy story and an element of surprise in that we don't really know what's going on or what we are supposed to be looking for here. As the film begins to drag a bit though we can tell where the story has been tweaked to fit Ledger's untimely death and it is ultimately a bit of a let down that it falls into the applied structure of many other films. Inserting three just as famous and just as artsy actors to fill the movies holes is a fine idea, and it is done to the best of all their abilities here, but you can't help but wish Ledger had been able to finish the film himself. There is plenty to love here though. Plummer is doing some great work as the title character and new comers Lily Cole and Andrew Garfield create a very organic chemistry that helps give the film a sense of authenticity that would otherwise be non-existent. The performance I enjoyed most though, while slightly conventional was Mr. Tom Waits. His version of the devil is sly and creepy. A betting kind of guy that can't help but mess with Parnassus. The interaction between these two offers some of the best parts of the film. The star here is Ledger though, and luckily he had the opportunity to greatly show off his charm and wit in scenes where he coaxes women into the mirror. These are both funny and heartbreaking. Knowing this is the last we will actually see of Mr. 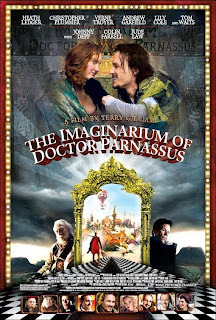 Ledger on screen gives off a deep sense of sorrow, but watching him exude these qualities allows one the ability to smile as they travel into the strange, colorful and very inventive world that is the imaginarium of Dr. Parnassus.